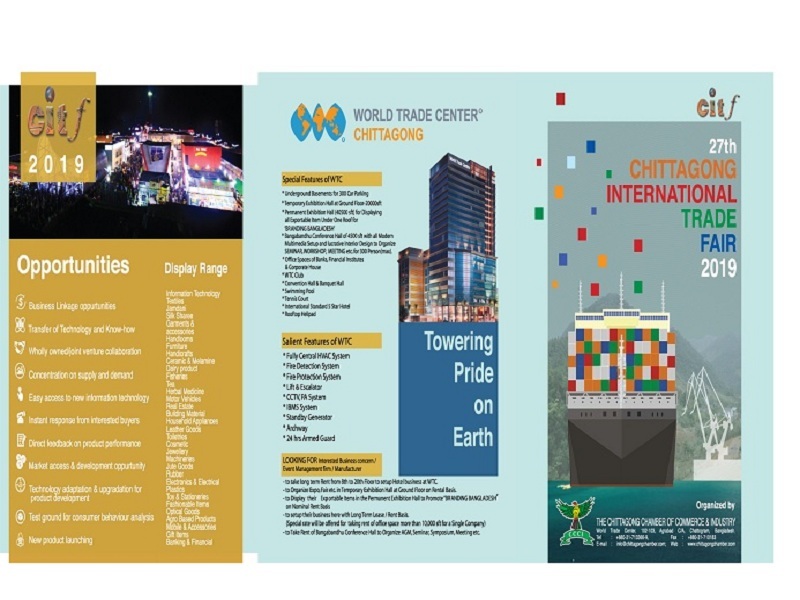 Greetings from the Chittagong Chamber of Commerce & Industry. 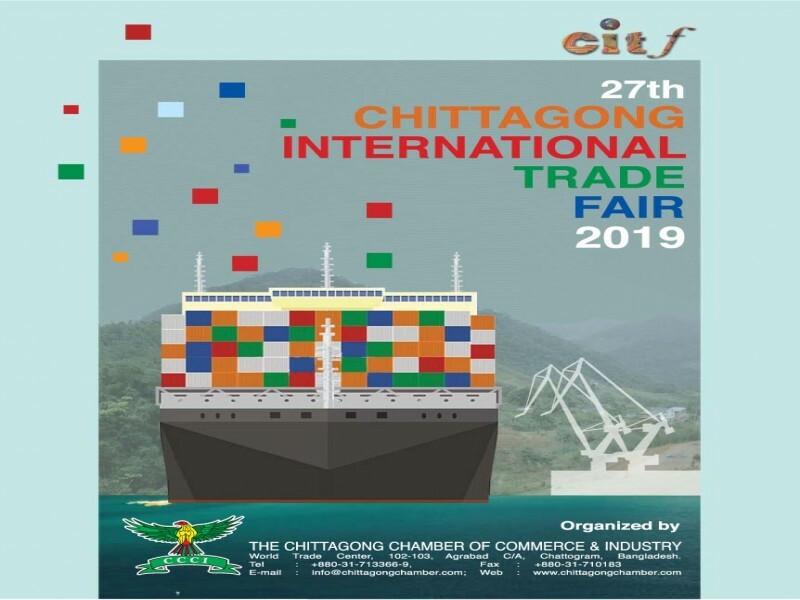 It’s our privilege to inform you that the Chittagong Chamber of Commerce & Industry is going to organize the month long 27th Chittagong International Trade Fair (CITF) 2019 from the third week of February, 2019 at the Railway Pologround premises in Chittagong, Bangladesh. Since 1992, CCCI has been organizing this trade fair which has now become the largest one in the private sector of the country. Beginning with the local SME products, the fair has taken international shape as many countries like India, China, Japan, Korea, Iran, USA, UK, Turkey have been participating for many years. The fair provides opportunity for both the products of home and abroad to promote and share more market as well as have a comparative study about quality and standard. It is visited by more than one million people and works as a platform for bridging direct relation between the manufacturers and the consumers. It has also become a place for recreation for the city dwellers. The colourful event is now most cherished and expected one to all concerned. We do like to organize the fair with more enthusiasm & festivity this year. 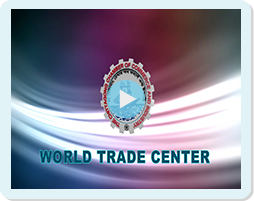 You have always been cooperating with CCCI which we treat as an emblem of our heartfelt relation. In this backdrop, we would like to request your honour to take initiative to encourage and motivate organizations from your country to participate in this very fair. 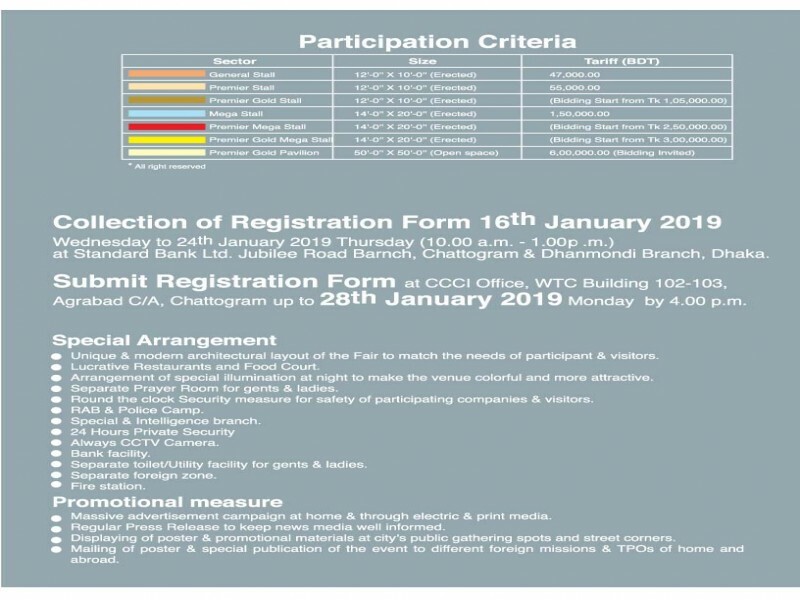 CCCI ensures its commitment to rendering all out cooperation so that the interested organizations of your country can participate in this event successfully. You are earnestly requested to disseminate the information to respective parties to make the venture a success. 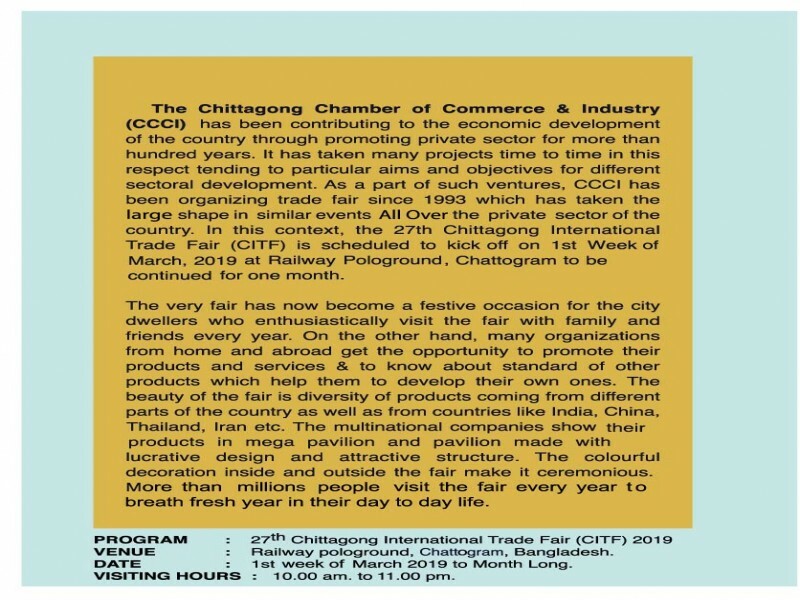 For detail information of the fair, interested participants can log on to our official Website: www.chittagongchamber.com or contact us directly through Tel: 880-31-713366-9, Fax: 880-31-710183, E-mail info@chittagongchamber.com. Any sort of queries about the fair will be highly appreciated. 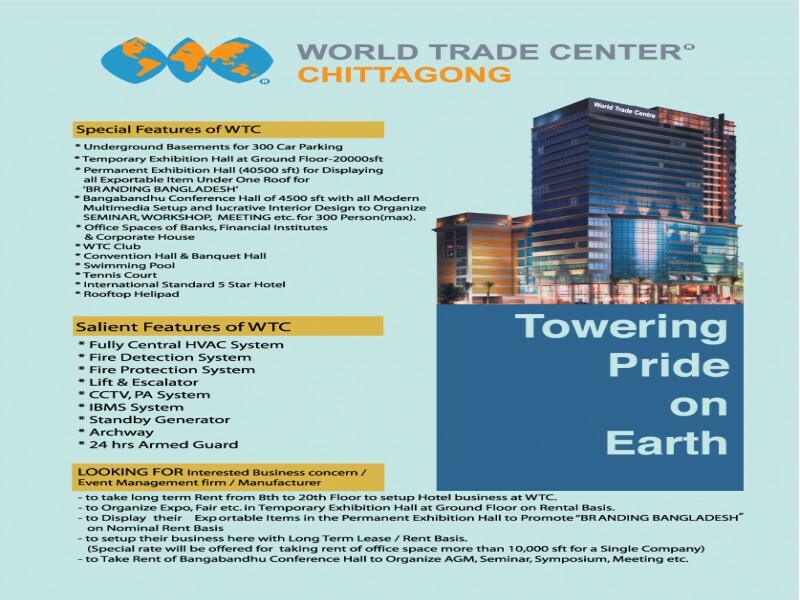 The Chittagong Chamber of Commerce & Industry (CCCI), established in 1959, is a premier Chamber of Bangladesh. It provides a wide spectrum of services to the trade and industry and acts as a catalyst for growth of business in the country. The Chamber has been all along very keen to address the requirements of the commercial capital and aspirations of entrepreneurs so that a congenial atmosphere is assured for growth of trade, industry & economy including induction of more FDI to some potential sectors that offer alluring profit guarantee. 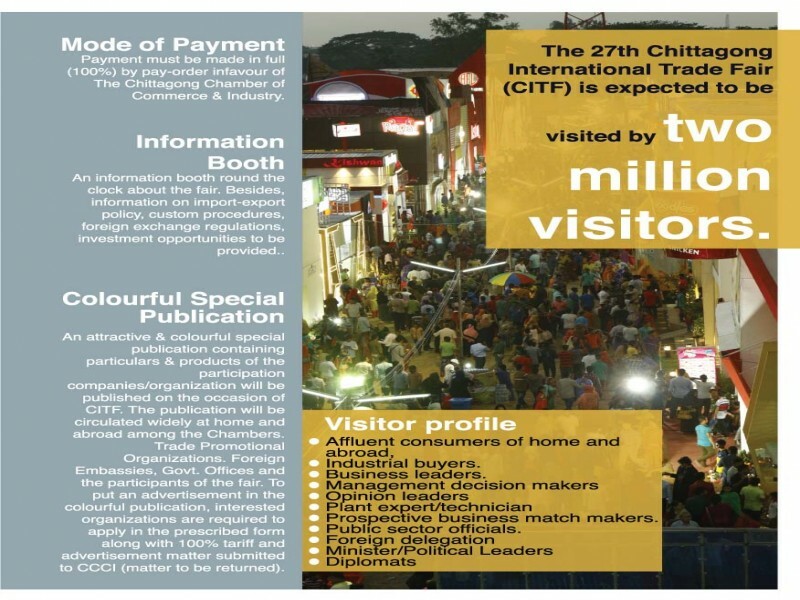 As part of its various trade promotional activities, CCCI has been arranging Chittagong International Trade Fair (CITF) - the largest international trade fair in the country for the last fifteen consecutive years and the event has been a total success with respect to enthusiastic participation by leading local, foreign and multinational business & manufacturing enterprises of Asia, Europe, USA and African countries. 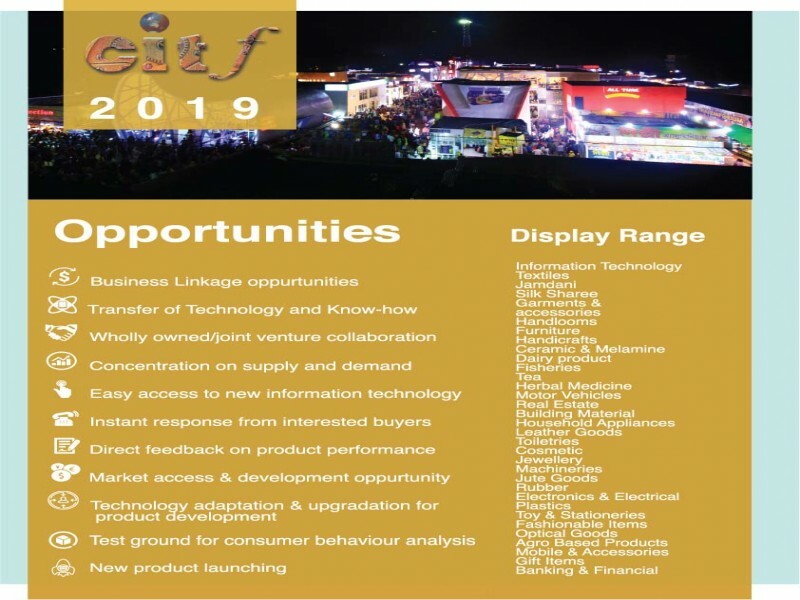 Since its humble striding in 1992, CITF has created a tremendous enthusiasm among the exhibitors & visitors registering a significant growth in terms of participants, sales and promotion of products/services. 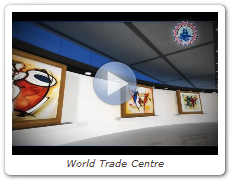 With the passage of time, the event has emerged as the largest international trade fair of the country in term of participation. Arrangement of special illumination at night to make the venue colourful and more attractive. Separate Prayer Room for ladies & gents. Round the clock Security measure for safety of participating companies & visitors. The previous Fairs were visited by visitors from the following segments. Affluent consumers of home and abroad. Transfer of technology & know-how. Wholly owned or joint venture collaboration. Easy access to new information/Technology. Instant response from interested buyers. Direct feedback on product performance. Market access & development opportunity. Technology adaptation and upgradation for product development..
Test ground for consumers buying behaviour analysis. Massive advertisement campaign at home & abroad through electronic & print media. Regular Press Release to keep news media well informed. Displaying of poster & promotional materials at city's public gathering spots and street corners. Mailing of poster & special publication of the event to different foreign missions & TPOs of home and abroad. Distribution and Aerial dropping of leaflets containing information on the event. Payment must be made in full (100%) by cash (Taka/US$)/demand draft/pay order in favour of Chittagong Chamber of Commerce & Industry. An information booth with round the clock Fax, E-mail & Telephone facilities will be available to provide one stop information about the Fair. Besides, information on import-export policy, custom procedures, foreign exchange regulations, investment opportunities etc. 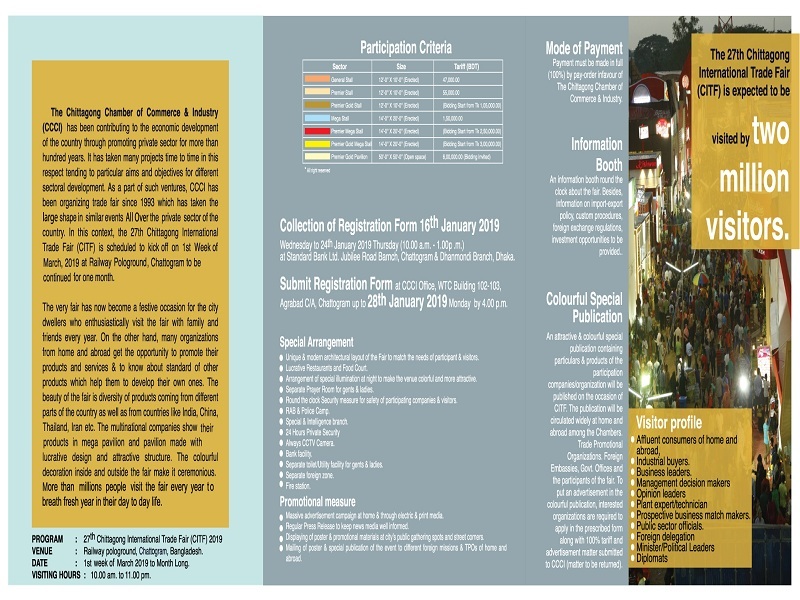 will be provided to visitors & exhibitors. Pavilion & Booth will be allotted on FIRST COME FIRST SERVE BASIS. Registration form charge: for Pavilion Tk. 6000/- and for Stalls/Booths Tk. 4000/- & Restaurant Tk. 4000/-. Booth & Pavilion will be handed over with a serial number only. Display product's nature should be specified. 1 Companies / firms interested to participate in the fair have to submit attested photocopies of current individual Trade License, TIN Certificate, VAT Payment Receipt and Bank Solvency Certificate alongwith the Registration Form for allocation of Pavilion/stall etc. 2 The decision of the Fair Committee with respect to allotment of Stall/Booth/Mega pavilion/Mini Mega Pavilion, will be final. 3 The participants will not be allowed to transfer/sublet the allotted Stall/Booth/Mega pavilion/Mini Mega Pavilion without prior written consent from the Fair Committee. 4 If any applicant fails to exhibit, participation charges paid shall not be refunded. 5 Carrying of samples to the booth/pavilion will have to be done before 9.30 A.M. and after 11.00 P.M. every day. 6 Arms, explosives, inflammable items, poisons, narcotics and those goods which the Fair Committee consider obstructive to the decency or administration of the Fair, are strictly prohibited to exhibit. 7 Pre-Shipment Inspection (PSI) is mandatory for Import of goods into Bangladesh (for Foreign Participants only). 8 Clearance of goods will be allowed on submission of PSI report and on payment of custom duties and taxes or on submission of Bank Guarantee for equivalent amount at the Customs Point of Entry (for Foreign Participants only). 9 If the venue or part of it is destroyed by fire, earthquake, storm, war, civil disturbances or riot and other irresistible force or acts of God, which may be regarded as beyond the control or responsibility of the CCCI management, the affected party or participant(s) will not be entitled to claim compensation or refund of its/their deposited tariff. No extension of the fair will be granted on the plea of less sale, less visitors, natural calamity, hartal or political disturbances and the above reasons. 10 In the event of any unforeseen occurrence in these terms and conditions, the decision of the organizer shall be final. 11 No allocation for sale of Fast Food in any stall/pavilion except Fast Food Corner. No use of oven in any stall except in restaurant(s). 12 No application shall be entertained unless it is in prescribed Registration Form with full particulars alongwith other requirements. 13 No participant shall be allowed to leave the venue or move materials without NOC from CCCI Authority. 15 Erection of Tower or making of fountain will be allowed on the basis of prior written permission & subject to payment of specific tariff in each case. 16 Participants shall have to pay extra charge with respect to rent & power tariff proportionately for additional days if the fair is extended beyond specified days i.e. (Total Rent/30 x total extended days) including electricity bill as per consumption must be paid in cash within 24 hours of such extension at CCCI Office in the fair. 17 Use of Audio / Video / Loudspeaker / Mike for advertisement of products / services is strictly prohibited. However, one may go for publicity through advertisement booth in the venue authorized by the Committee. 18 Every pavilion will have to deposit Tk. 5000/- as Security Money (refundable) subject to removal of all infrastructure/materials after completion of the Fair.